House prices contracted for a third straight month in March by 8.8% y/y, the sixth contraction in the last seven months. The decline meant the price of the average home was cut by N$109,941 from what it was this time last year to N$1,136,030. When disaggregated, property prices in the middle price segment stagnated, while property prices in the upper price segment contracted by 3.0% y/y. Conversely, property prices in the lower price segment increased modestly by 3.4% y/y. Additionally, year to date data shows property prices across 14 towns, including the capital Windhoek, contracted. Volumes however increased 11.7%, driven primarily by the new affordable housing supply and improved land delivery. Volumes in the lower price segment have consequently risen by 17.9%, while land delivery has increased by 58.0%, bringing partial relief to those in the housing backlog. Both the middle and upper price segment recorded volume increases as well, albeit minimal. However, transactions in the luxury housing segment have dried up, with only one transaction registered in the past four months. Given the likelihood of more affordable housing stock entering the market and the delayed reaction to the economic downturn, we expect property prices to retreat even further and remain under pressure for longer - allowing the market to correct after decades of exuberant house price inflation. Sellers seem to remain denial on pricing shifts, as 91% of homes sold in the period, sold for below asking price, which points to overly optimistic prices in an ultra-cautious buyers’ market. 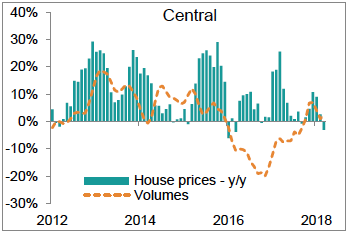 Central: As anticipated, central property prices contracted by 3.1%, following price weaknesses in the upper segments where property prices fell by 4.1% y/y. In the capital, property prices fell for the second time in twelve months, albeit by a modest 0.6% y/y, whilst Okahandja prices contracted by as much as 13.7% y/y. Volumes increased by 2.2%, driven primarily by increased affordable housing supply in Windhoek and Okahandja. 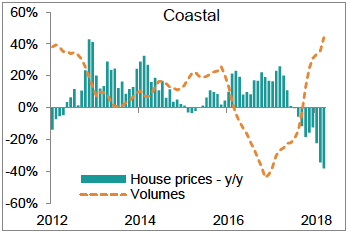 Coastal: The coastal property prices fell for the ninth month in a row - this time by 38.0% y/y – as changes in the housing mix comes into play. Here, sales are increasingly concentrated in the lower segments (84% of total volumes), bringing the overall average price down. Consistent with this development, property prices fell by 33.4% y/y in Swakopmund and by 40.3% y/y in Walvis Bay. Given the strong mass housing and aggressive land delivery at the coast, price weakness has begun to trickle down to the middle and lower property prices segments, where 13.8% y/y and 14.8% y/y contractions were recorded respectively. Additionally, volumes shot up by 44.2% through March, with most of the supply coming through the middle and lower price segments. Demand in the upper and luxury segments has stagnated under the current economic backdrop. FNB’s Estate Agent Survey reported properties spending about 24 weeks on the market at the coast whilst the agents’ affordability perception index ticked up, in that income levels are “far” behind house price levels. 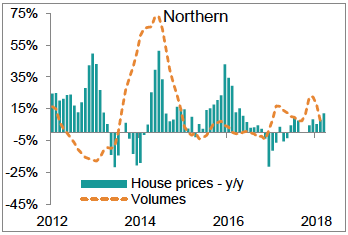 Northern: In contrast, the northern property price inflation is picking up after months of negative price growth. Property prices in this region increased by 12.3% y/y, their highest in almost two years. This was driven primarily by properties in the lower to middle price segments, which have begun to record positive growth, while the upper price segment remains in decline. 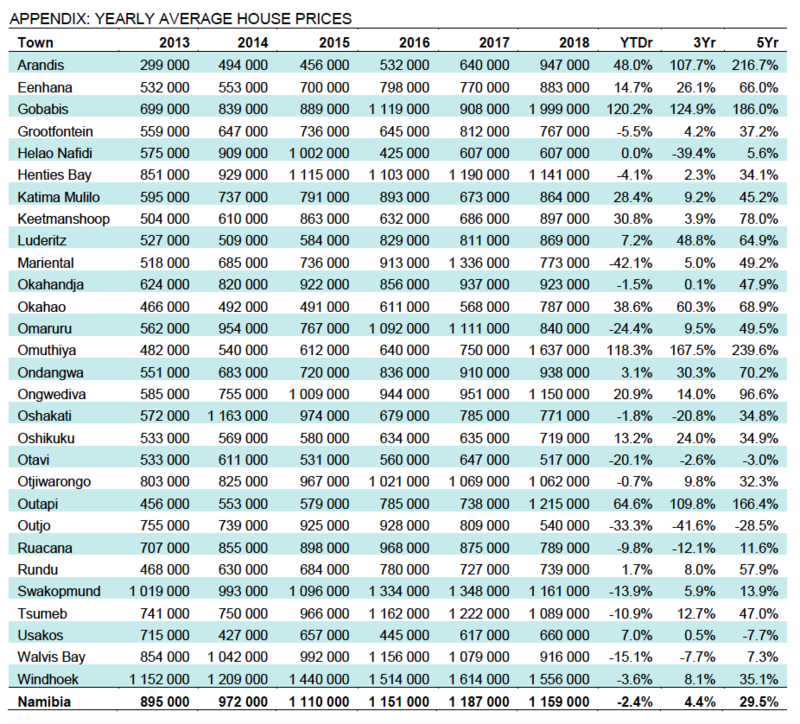 Meanwhile, house prices are still falling in Katima Mulilo (-21.4% y/y) and Rundu (-3.7% y/y) on the back of increased supply in these markets. Mortgage extended to the northern region increased by more than 36% in the last twelve months to N$1.49 billion, retaining its second largest mortgage market status. 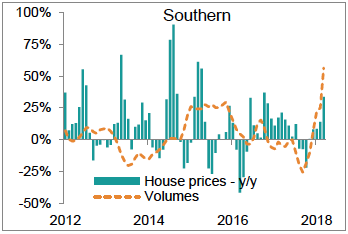 Southern: The southern market is persistently volatile, and as such should be interpreted with caution. In March property prices rose by 33.8% y/y, after decreasing by more than 21% just five months ago. Volumes were up by as much as 65% through March, but with a small base, the volatility remains high. House price growth has diminished and the recent developments suggest that we are set to face price correction as affordable property supply increases at a time where subdued economic activity persists and labour uncertainty is high. These factors have curtailed housing demand, and with mortgage advances growing at a paltry 8.1%, property prices can only contract. Furthermore, with more serviced land entering the market, the price pressures will only intensify. 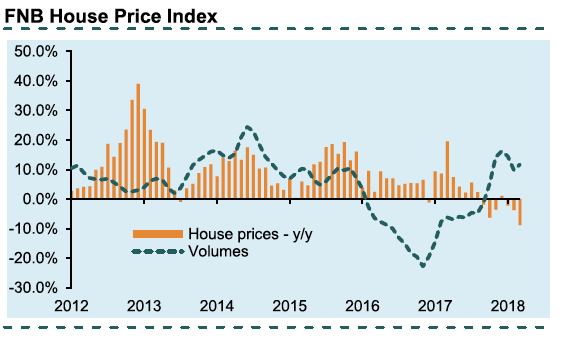 It is for these reasons; we have revised our house price expectations to reflect a market correction after decades of robust house price appreciation. Although our econometric models do suggest a modest recovery in 2018, the housing market will take a bit longer to recover. Nothing economically looks very strong, just mildly better than where we come from, and as such, house prices are expected to contract even further through 2018. Current forecast points towards price contractions of 5.8% for 2018 as a whole, easing to 1.2% in 2019. This report is based on bonds registered in the names of natural persons at the Deeds Office and as such excludes all bonds registered in the names of juristic persons such as Close Corporations, Private Companies and Trusts. Rehoboth properties (Rehoboth has its own Deeds Office), farms, properties over 100,000m² and properties in industrial areas, are excluded, as these may not always be residential properties. Outliers below N$100,000 (2007 prices adjusted annually) are also excluded, along with further bonds (second, third, fourth, etc. bonds over the same properties). Exclusions were rigorously tested using existing data, to filter out as much noise as possible. Cash transactions are too, excluded due to a lack of data. Sectional bonds have been excluded into the housing index. 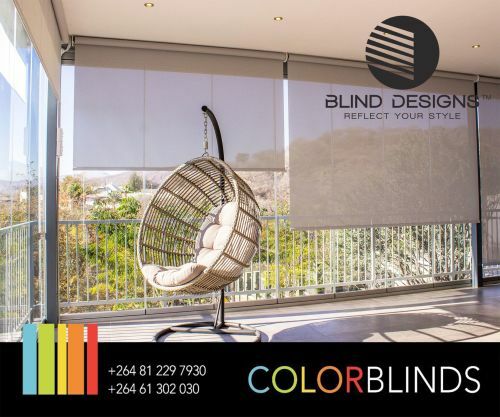 Bond values are used as a proxy for house prices, since there are no consistent records for house prices in Namibia and therefore prices shown should only be used as a general guide to property values. These values are aggregated by way of the mean value as the central measure of tendency to resist the fluctuation between different prices. Average house prices are smoothed using a twelve month moving average, with the national value computed as a weighted average of regional prices. Whilst the information provided has been obtained from a credible source, the values quoted are indicative, and past performance should not be taken as a guarantee of future performance. Disclaimer: The information in this publication is derived from sources which are regarded as accurate and reliable, is of a general nature only, does not constitute advice and may not be applicable to all circumstances. Detailed advice should be obtained in individual cases. No responsibility for any error, omission or loss sustained by any person acting or refraining from acting as a result of this publication is accepted by FNB Namibia Holdings Limited and / or the authors of the material.